I loved Christmas as a kid. The excitement of gifts was a small part of it, but what I really liked was the music, the yummy family cookies, and the Christmas tree. There are so many fond memories of Christmas with family. My dad would string the hundreds of glistening, white lights and then we would decorate the tree together. Once we finished, or at least once we grew tired of the activity, we would retire to the kitchen with my grandmother, Bobbymom, to eat her yummy sugar cookies we called sandtarts. It really is a time of year filled with great memories. As a child with a unique perspective on life, a perspective later named autism, I had my own quirks and issues to deal with at the holidays. Most everyone knows that I have music going on in my head all the time; songs that hear in everything I see which I call Shadow Songs. You can imagine that a phenomenon inside me that is triggered by what I see would be extra stimulated during the holiday season. It was much like having 10 radios on 10 different stations playing in my head at the same time. To cope, I would play non-stop Christmas records like Alvin and the Chipmunks Christmas Album, or the Rudolph the Red Nosed Reindeer story I had on record. I even remember a part in Rudloph where a helicopter would land at the North Pole, which was a sound that scared me, so I would hide under my table until that part was over. My mother also had a fantastic collection of Christmas records that we enjoyed listening together. My favorite all time Christmas song from her collection was It’s Beginning to Look a Lot Like Christmas by Johnny Mathis. Though Santa wasn’t my only issue at Christmas. I couldn’t understand why some stuffy headed kid wanted a Hippopotamus. Was this the same kid that only wanted two front teeth last year? Furthermore, why was some guy named Jack biting your nose while you roasted chestnuts? Or why on earth would anyone want to put fleece on the dog (Feliz Navidad)? How was I supposed to know they were singing in Spanish? Like every kid, I was driven crazy wondering what was in each gift wrapped box, even if it wasn’t for me. That curiosity was usually followed by the anxiety that there could be something awful in that box. What if I got itchy socks, or another one of those weird woven sweaters that I would have to try on and parade around the living room while everyone touched the arms of the sweater saying, “it’s so soft”? My grandfather, whom I called Bobbydad, was always ready with the perfect gift – cash. He would call us up one by one, and hand us one-dollar bills that equaled our current age, plus one to grow on. You always knew what you were getting from him, and exactly how much. It was the best part of the family gift exchange. 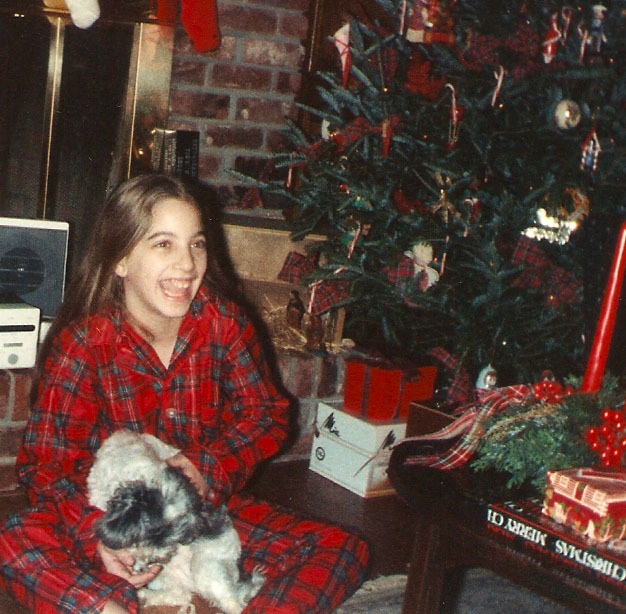 Christmas morning always brought the best feelings. I’d open my eyes, still unable to think or feel anything. Then, a feeling of exhilaration would build in the following 30 seconds between waking, and realizing it was Christmas morning. It was all under control now. I knew everyone would be tired from the festivities the night before, so they would be quiet and calm. I also knew exactly what to expect. We would get oranges in our stockings, open our gifts, and then spend the day in our fleece pajamas watching Christmas movies and playing with our new toys. But that wasn’t even my favorite part yet. Among the gentle clatter of ripping paper, and gasps of excitement, there would be a calm. In that calm, in that single moment of silence, while everyone pondered with smiles on their faces, a beautiful sound would play. Like a whisper from the warm glow of joy, I would get to hear the Christmas shadow song. Even though I know there is the chaos that surrounds the holiday season, I surf through it on the wave of holiday music. I remain calm, and I smile, because I know I will be given a gift so pure and honest, made up of the collective energy of kindness and generosity. That moment that rises from the calm; the shadow song of an autism Christmas.